Hi everyone! I'm terribly sorry for the long wait! I am now over my lovely pneumonia and the flu! It has been rough week and half, but now with just a lingering cough I am able to return to life. I'll be posting again more frequently, but here is a quick shot of Bellingham Bay I took a couple weeks ago. 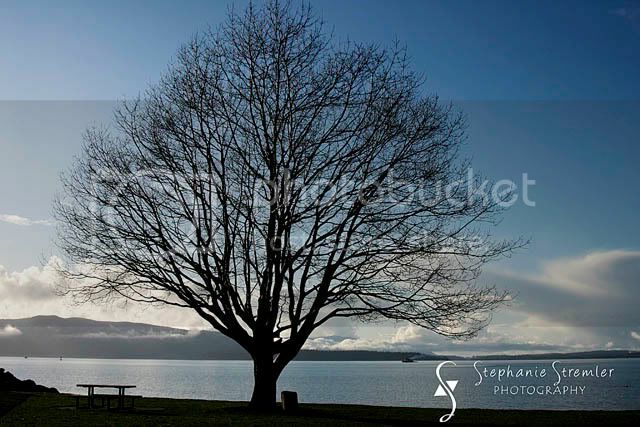 I loved the structure of this tree in front of the smooth, quiet bay. A few things to look out for in the near future...more of Preston's senior pictures as promised, more images from my personal photo shoot at Bellingham Bay and remodeling update images--we're installing our new front door this weekend! So have a great rest of your week and thanks again for all of your thoughts and prayers! They have been heard and answered!